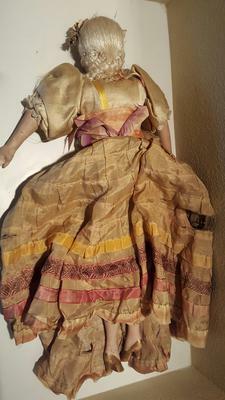 I was given this doll as a child in the early 1960's. We were told at that time she was 100 years old. Her head is made of a sculpted harder material covered in what looks like silk stocking material. 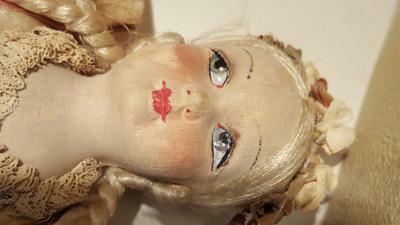 Her features are then painted and she has extended eye lashes. She has silky hair with a flower head piece pinned on. 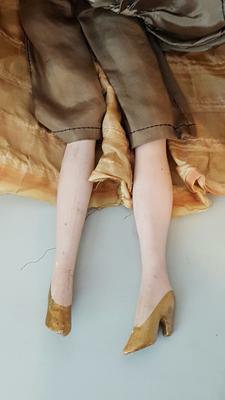 Her head is attached to a cloth body that feels like it is stuffed with something grainy like cork and covered with the same stocking type material. Her arms and legs are made of bisque? from the elbow and knee down. She has painted nails and high heels. He clothes appear to be silk, ribbon and lace. There is wire in the under skirt. Colthes are attached with thread and pins. I have never removed them. Unfortunately she is an old girl. Her face and clothes are showing their age and one thumb is missing. Any help identifying would be so appreciated.